Directly beside a beautiful sandy beach, approximately 33 kms from the centre of Kusadasi, this beach prides itself on its location. Links to the public transport network are within walking distance, as is the beautiful town of Ozdere. It is some 45 kms to Izmir airport. Boasting a seafront view, this hotel is sure to create long lasting picturesque memories unlike any other. Coupling traditional Turkish architecture with an infusion of modern furnishings, guests will enjoy the utmost comfort whilst staying here. Guest rooms are tastefully decorated oozing poise and elegancy. Idyllic views of the pristine coastline are offered to each guest. Guests can enjoy 2 swimming pools, a private stretch of beach, or may enjoy an invigorating workout in the hotel gym. Breakfast is served buffet-style insuring that guests can prepare themselves for their journey ahead. Enjoy international cuisine at Tamarind, one of the hotel's 4 restaurants, or stay in and take advantage of the 24-hour room service. Wrap up your day with a drink at the bar/lounge, the beach bar, or the poolside bar. A complimentary buffet breakfast is served daily from 7 AM to 10 AM. When you stay at Club Marvy in Menderes, you'll be by the sea and 5 minutes by car from Ozdere Beach. This 5-star hotel is 18.1 mi (29.2 km) from Ephesus Ruins and 19.1 mi (30.7 km) from Adaland Aquapark. Make yourself at home in one of the 470 air-conditioned rooms featuring minibars and LCD televisions. Rooms have private balconies or patios. Complimentary wireless Internet access keeps you connected, and satellite programming is available for your entertainment. Private bathrooms with bathtubs or showers feature complimentary toiletries and hair dryers. When you stay at Dogan Beach Resort & Spa Hotel in Menderes, you'll be 14 minutes by foot from Ozdere Beach. This beach hotel is 17.9 mi (28.7 km) from Ephesus Ruins and 18.8 mi (30.3 km) from Adaland Aquapark. 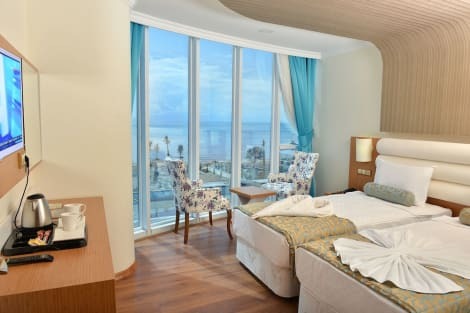 lastminute.com has a fantastic range of hotels in Ozdere, with everything from cheap hotels to luxurious five star accommodation available. We like to live up to our last minute name so remember you can book any one of our excellent Ozdere hotels up until midnight and stay the same night.